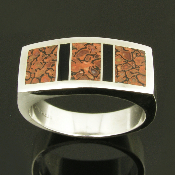 Our bold dinosaur bone rings for men feature fossilized dinosaur bone inlay in a variety of colors and patterns. 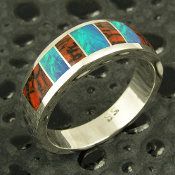 The varying cell size and colors create some truly unique patterns and virtually one of a kind dinosaur bone rings. 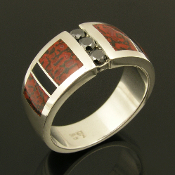 Our men's dinosaur bone ring designs may be customized by substituting gray dinosaur bone where you see the red dinosaur bone or vice versa. The most popular bone color choices are red, gray and blue. 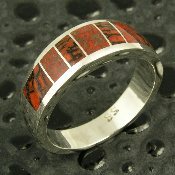 Our men's dinosaur bone rings are made to order in men's ring sizes 8 to 11 in about 4 to 6 weeks. 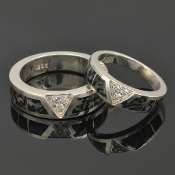 Men's ring sizes over 11 will be an additional charge for wax work and metal. 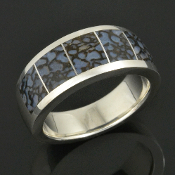 Most of our men's dinosaur bone rings are also available in Continuum silver, 316L stainless steel or 14 karat yellow or white gold for an additional charge. 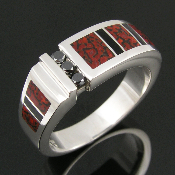 Dinosaur bone sterling silver man's inlay ring handmade by artisan Mark Hileman. 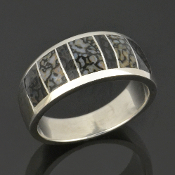 This unique ring features 7 pieces dinosaur bone inlaid in sterling silver. 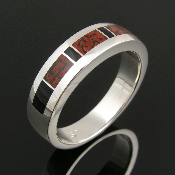 Dinosaur bone ring with black onyx in sterling silver Man's band inlaid with red dinosaur bone and black onyx Silver man's band inlaid with dinosaur bone and black onyx. 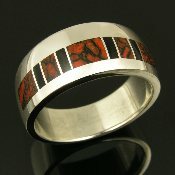 Handmade sterling silver band inlaid with red dinosaur bone and black onyx by jewelry artist Mark Hileman. 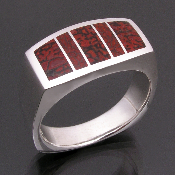 Four pieces of black onyx accent the five pieces of red dinosaur bone with black webbing. 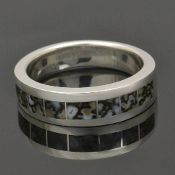 Handmade sterling silver wedding band inlaid with dinosaur bone and black onyx. There are 5 pieces red dinoaur bone and 4 small pieces of black onyx. 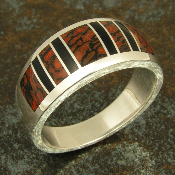 The dinosaur bone we use in our men's bone rings is usually referred to as “gembone”. It is actually not dinosaur bone but is a combination of minerals that have replaced the original bone over time. Fossilized dinosaur bone is found in a rainbow of colors with the webbing color and cell size varying greatly from piece to piece. 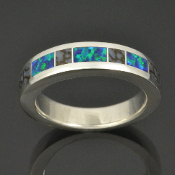 The varying cell size and colors create some truly unique patterns and virtually one of a kind dinosaur bone rings. 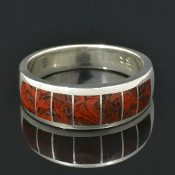 The fossilized dinosaur bones used in our rings can be composed of many different minerals including agate, jasper and calcite. The dinosaur bone color and hardness is determined by the combination of minerals present when the fossilized bone formed. Some bone colors are more rare than others with multicolor cells in a nice pattern being the most sought after for jewelry use. 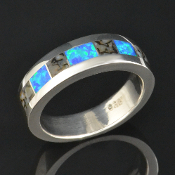 The high quality dinosaur bone in our rings has a hardness of 6-7 on the Moh’s scale, making the rings fairly durable. 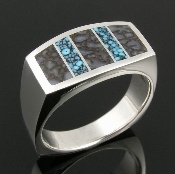 The agatized Utah dinosaur gem bone in the rings pictured above came from the Colorado Plateau and was a living animal during the Jurassic Period around 144 to 208 million years ago. 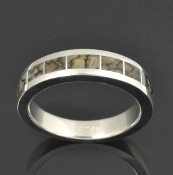 Our dinosaur bone rings allow you to wear a unique piece of the Earth's history on your finger.